Julien Jeulin & Associés offers a domestic and international client-base, comprising multinationals, SMEs, individuals, accountants and law firms without a tax department of their own, an alternative to the big networks and tax departments of traditional firms. Julien Jeulin & Associés has also developed a reputed expertise in the preparation and the application of the fiscal and social policies of multinational groups. Taxation of merger & acquisition transactions: Julien Jeulin & Associés assists and advises its clients on all tax issues relating to their restructuring and acquisition transactions (structuring of transactions, management of intragroup cash flows, drafting of requests for approval, tax audits and evaluation of tax risks, drafting of warranty clauses, etc.). Corporation tax: In this area, the lawyers in Julien Jeulin & Associés' tax department assist their clients in applying tax rules which apply to their business in a proper and optimal manner and, for example, in relation to VAT, territorial economic contribution, the calculation of the amount of the research tax credit, tax on salaries or the calculation of taxable income. Property taxation: Julien Jeulin & Associés assists and advises its clients on all of their tax issues relating to their property transactions (VAT, property dealer status, management of capital gains on property, 3% tax, optimisation of stamp duty, etc.). Taxation on assets and individuals: The lawyers in Julien Jeulin & Associés’ tax department very regularly assist individuals in determining and implementing asset planning, in particular in order to prepare for business transfers (gifts prior to transfer, establishment of family holding companies, etc.) and in structuring their other asset transactions (property or other investments). They also assist them in the full or partial management of their income and wealth tax declaration obligations. 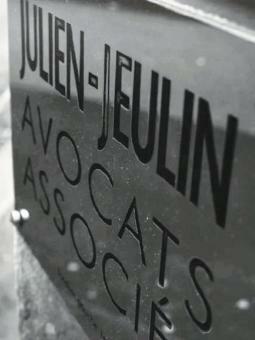 Tax assessments and disputes: Julien Jeulin & Associés assists its clients in relation to their tax assessments. The firm’s lawyers act as contacts for the tax administration throughout the assessment, during the adversarial debate as well as at the stage of drafting a reply to any suggestions for amendments. They also assist the firm’s clients at the administrative courts and the administrative appeal courts in their tax disputes. Financial engineering: Julien Jeulin & Associés assists its clients in relation to debt refinancing and asset financing, both nationally and internationally.